I’ve got this good buddy in Hemphill, Tx. His name is Grumpy. the following is tasty. Hope you enjoy. CHOCOLATE COBBLER – For all chocolate lovers??? Directions: Preheat oven to 350. In a 9×13 pan or Pyrex baking dish, melt the two sticks of butter in the oven. Mix together in a bowl the sugar, flour, vanilla and milk. Once the butter is melted pour the batter over the butter, “do not stir”. Sprinkle cocoa/sugar mixture on top of batter. “Do not stir”. How small is planet earth ! An Upshur County game warden and a Wood County game warden investigated an anonymous tip about two duck hunters shooting a 10-man limit of ducks at an unknown location one morning. The only evidence the tip offered were a possible last name and a photograph of one individual posing with 60 ducks. Later that evening, the wardens identified, located and interviewed the two individuals involved, who both admitted to shooting 60 ducks over a baited pond as well as dumping 55 ring-necked ducks in the woods to waste. The ducks and bait were located and collected for evidence. Multiple cases and restitution are pending. 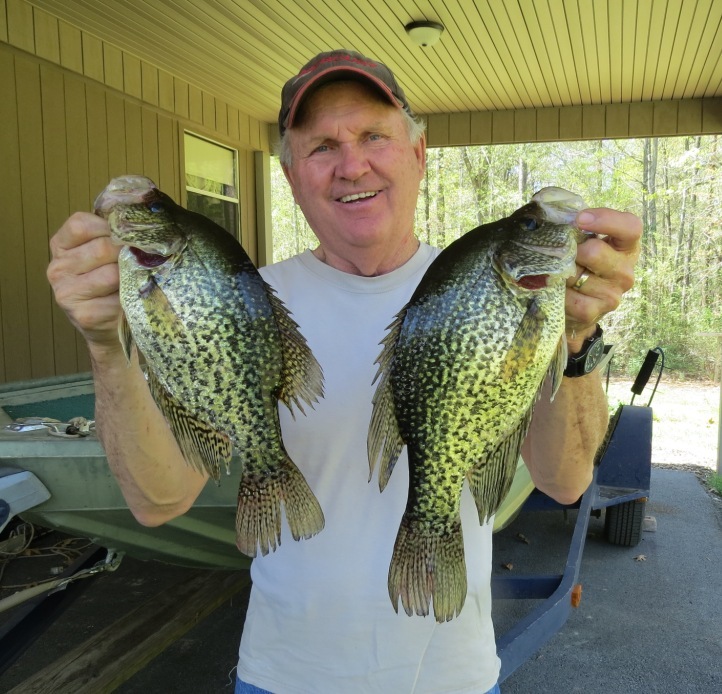 A Smith County game warden was sitting on a night set watching two pastures. After a while, a car drove by, slammed on the brakes, swerved into the bar ditch and turned around quickly. The car sped up for a short distance before swerving into the bar ditch and turning around again. The warden watched the vehicle do this two more times before catching up with it and making a stop. When the warden asked the driver what he was doing, the driver replied he was trying to run over an opossum that was trying to cross the road. The warden could smell a heavy odor of marijuana coming from the driver, who admitted to possessing a small amount. The warden issued citations and the cases are pending. Dude, Where’s My Deer Head? Two Jasper County game wardens went to a local deer processing plant and began inspections, during which the owner of the plant became very uncooperative, telling the wardens they had no right to look at his business. The wardens stepped out of the plant to discuss the several class C violations they found at the plant, and upon their return to the plant, they noticed a deer head in question with undersized antlers was missing. The wardens filed felony charges for tampering with evidence and the undersized buck was eventually found. As an Atascosa County game warden was on patrol, he came across a parked truck on the side of a county road that was “out of place.” He ran the rear license plate and it did not come back stolen. However, upon further investigation, he learned that was in fact actually stolen and had been for two weeks. In addition, the truck had been used to carry undocumented immigrants from South Texas to a designated drop off point in Atascosa County. The truck was going to be reused for that same purpose until the warden happened upon it during his routine patrol. Those responsible had switched out the back license plate with a similar truck’s license plate. Several Texas game wardens helped investigate a group of trespassers on the East Wildlife Foundation property after receiving a picture of two individuals walking into the ranch from the southern boundary fence. Based on prior intelligence, the wardens believed these trespassers were the same ones that had gotten away from them just two weeks prior. In all, five wardens and two ranch security personnel waited alongside a trail the trespassers had used previously, where they successfully apprehended to Mexican nationals with about 103 pounds of peyote. The wardens charged the trespassers with criminal trespass class B misdemeanor and possession of controlled substance first degree felony. Further investigation could lead to organized criminal activity charges. While investigating a poaching case, two Webb County game wardens visited the local taxidermist hoping to locate a missing deer. While going through the records, the wardens found two ram skulls that raised a concern. Further investigation proved that both rams were taken illegally. Both hunters who shot the rams were cited for hunting without a hunting license and no proof of hunter education. A Comanche County game warden had come home for lunch and parked his truck in the driveway when a knock came at the front door. 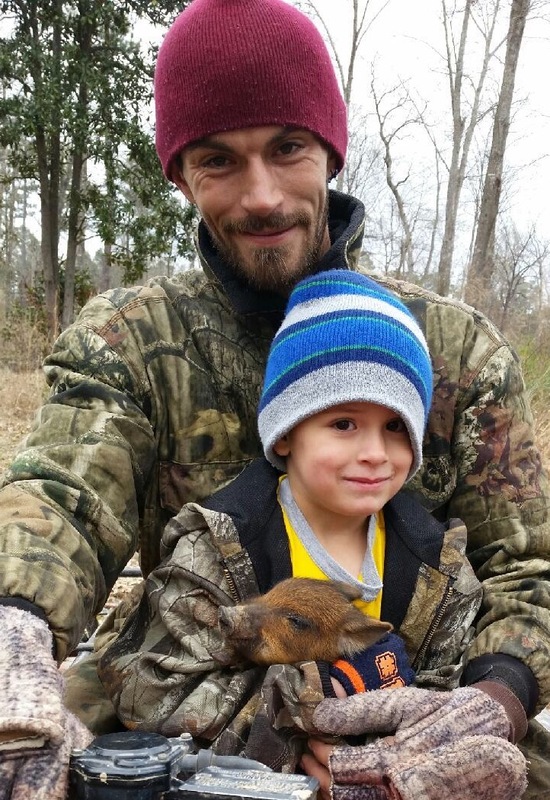 His wife answered the door to find a young man asking if she knew where he could hunt hogs. She said she didn’t know and sent him on his way. The warden got to the door just as the man was getting into his white truck to leave. He felt there was something off about the encounter, so he moved his patrol truck behind his house and set up where he could watch the oat field just across the highway. At dusk, he saw a white truck driving slowly on the highway and stop at the edge of the oat field. He then saw the man get out, remove a rifle form the backseat, sneak up to the fence and fire four shots into a herd of deer. Another car was coming down the road and spooked the man, so he ran back to his truck and made a U-turn just as the warden arrived to the scene. The warden proceeded to handcuff, search and read Miranda rights to the man before asking him, “What were you thinking?” The young man said, “I didn’t think you would be home.” The warden then searched the field but did not find a deer or any blood. The man said he had just bought the .243 rifle and had not bothered to sight-in the scope. The man was charged with hunting from a public road and hunting in a closed area. His new rifle was seized. While patrolling for duck hunters in Aransas Bay, two Aransas County game wardens came across a sea turtle stranded in the very cold and shallow water. The wardens then transported the stunned sea turtle to deeper water and helped it get going. The sea turtle successfully swam way. A McCulloch County game warden was patrolling a county road when a truck towing another truck on a flatbed trailer approached from the opposite direction. The warden met the approaching vehicle side-by-side in the middle of the road and began a casual conversation with the driver. The driver said that he and his buddy had met up in Brady to sell a truck at the scrapyard, but the scrapyard had not taken the truck due to some missing paperwork, so the guys decided to drive around and visit for a while before parting ways. Having been called out many times before to this specific county road for suspected road hunting violations, the warden asked if there were any guns in the truck. The driver revealed a loaded rifle tucked between the seat and the console. Further questioning and a driver’s license check indicated that the driver had a suspended license and a felony conviction. A deputy was called in for assistance on a vehicle search, which turned up .6 grams of methamphetamines, drug paraphernalia and open containers of alcohol. The driver was arrested for unlawful possession of a firearm, possession of a controlled substance and driving with a suspended license. Feral hogs at our farm are reproducing at an alarming rate. Their rooting has destroyed one hay meadow. This photo is example of their damage. During the day I’m on our tractor with drag, trying to level the damage. During the night, they are rooting. 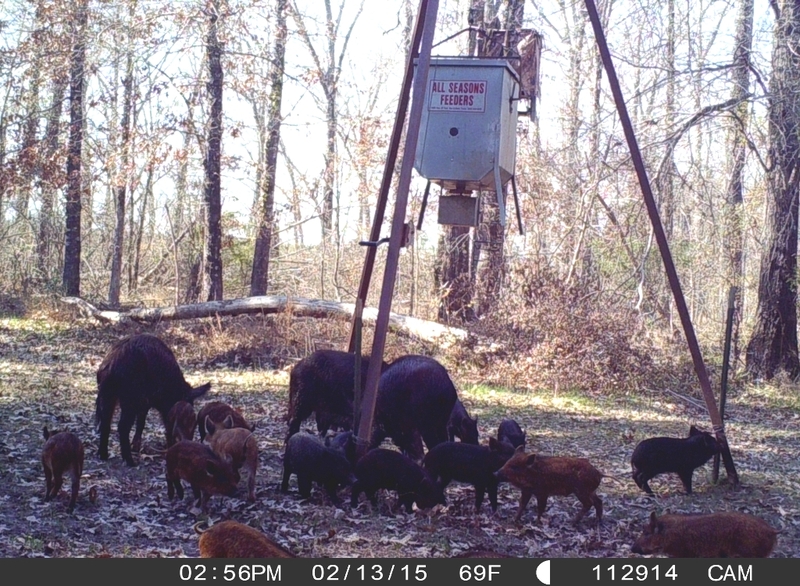 Our neighbor was checking the hog traps today when they noticed a momma hog with some babies. They chased and caught one of the babies. The pig is so cute, yet so destructive. His momma can have three litters of 6 to 12 pigs per year (gestation 115 days). 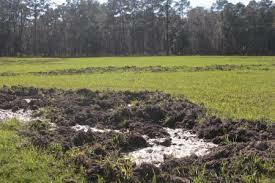 And the feral pigs are capable of breeding at six months of age but eight to ten months is normal. That’s much better than compound interest. Feral hogs generally travel in family groups called sounders, comprised normally of two sows and their young. Mature boars are usually solitary, only joining a herd to breed.